National Library Week celebrates the important contributions of libraries and library workers to our country. 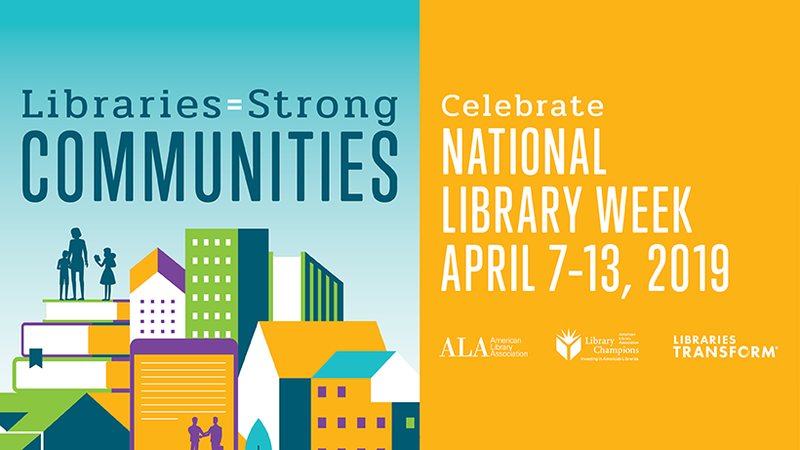 This year’s theme is Libraries = Strong Communities: Libraries play a vital role in our schools, towns, and communities, welcoming and encouraging people of all ages and backgrounds to come together, engage in meaningful discussions, and expand their knowledge. Libraries partner with civic and social organizations to provide engaging programs based on the interests and needs of the people in their communities. Libraries are constantly adapting to the changing world around them, and promotion of lifelong learning is at the heart of everything they do. In the spirit of learning, what better way to celebrate National Library Week than learning a few new things about libraries? The earliest library classification system was created during the Han dynasty. The catalog was written on silk scrolls and stored in silk bags. There are more libraries in the United States than there are Starbucks or McDonalds. America’s first lending library, The Library Company of Philadelphia, was established by Benjamin Franklin in 1731. It was a paid, subscription-based service that paved the way for the library systems we use today. It is now an independent research library concentrating on American culture and society from the 17th through 19th centuries. The Guinness Book of World Records, ironically, holds the record for being the most stolen library book. When he was 9 years old, Ronald McNair refused to leave the segregated Lake City library without checking out his books. The police and his mother were called, and he was finally allowed to check out the books. The library is now named the Ronald McNair Life History Center in his honor. The Haskell Free Library is located right on the border of the US and Canada. The building has two separate addresses and phone numbers, and it has even served as a place for Iranians impacted by the United States travel ban to unite. The Library of Congress contains the smallest printed book, Old King Cole. It is approximately 1mm x 1mm (different prints vary slightly in size) and the pages can only be turned with a needle or pin. There are about 150 Human Libraries in the world. The Human Library began in Copenhagen, Denmark in 2000. It aims to challenge prejudices and promote diversity by allowing people to “loan” another person that they wouldn’t normally meet to talk to and learn about them. Millions of books are exchanged each year through Little Free Libraries. Patrons use the honor system to borrow and return used books. There are more than 80,000 Little Free Libraries around the world. You can find some in your neighborhood and explore the map here. Libraries need funding to stay afloat. You can see the track records of senators and representatives who support library funding here and even arrange to have members of Congress visit your local library. Now that you know a bit more about libraries, you may want to know how you can best celebrate National Library Week: It’s easy! Donate to your APL Foundation to help fund innovation at Albany Public Library!